Sts. Perpetua and Felicity were North African friends martyred for their Christian faith in the amphitheater at Carthage. We know precise details of their imprisonment because Vibia Perpetua, a twenty-two year old of a distinguished noble family, kept a journal -- the first known written document by a woman in Christian history, with a concluding narrative by an eye-witness. Perpetua mentions that those arrested with her were a slave named Felicity and three men, Saturninus, Secundulus, and Revocatus. She details the misery of their cell, the efforts her father made to persuade her to recant, the naming of her family members, everyone who helped the martyrs, and those who condemned them. One person conspicuous in not being mentioned was her husband. As a noblewoman, she would have been married, but, for whatever reason, he was not there for her when one would think he would have been most needed. The person there for her was Felicity, who was expecting to give birth at any time. Perpetua’s greatest concern was that she have her baby son with her as long as she lived. Felicity was worried that she might not be allowed to die with her companions because of her pregnancy. In answer to prayer, she gave birth to a girl. The pain of the delivery was compounded by the mockery of the jailer; but she was assisted and comforted by Perpetua. On the day of their death, they alone refused to wear the required pagan costumes -- insisting on maintaining the dignity of their femaleness. They gave each other the kiss of peace, held on to each other as they were attacked by wild animals, and were finally beheaded. The companionship of these women inspired subsequent ages. Their feast has always been called by their names. Together they are named in the Roman Canon of the Mass. Perpetua’s journal became such a beloved text in North Africa that St. Augustine felt he had to warn people not to give it a reverence due only to Scripture. 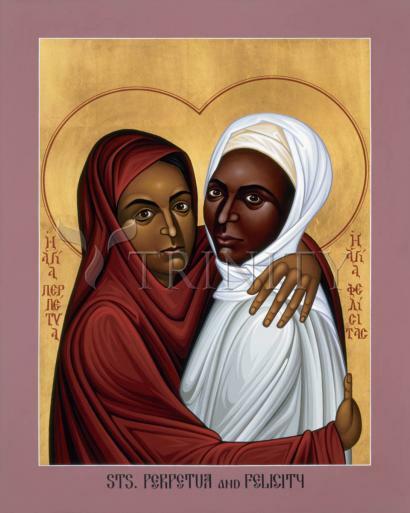 Perpetua’s feast day is March 7. So writes Perpetua, young, beautiful, well-educated, a noblewoman of Carthage in North Africa, mother of an infant son and chronicler of the persecution of the Christians by Emperor Septimius Severus. Despite threats of persecution and death, Perpetua, Felicity (a slavewoman and expectant mother) and three companions, Revocatus, Secundulus and Saturninus, refused to renounce their Christian faith. For their unwillingness, all were sent to the public games in the amphitheater. There, Perpetua and Felicity were beheaded, and the others killed by beasts. Died: Martyred 7 March 203 at Carthage; beheaded after being mauled by wild beasts. Felicity was a rich widow whose 7 sons were martyred in front of her just before her own execution.